July 24, 2011 - As part of its ongoing commitment to take smart steps to maintain high level security standards while also improving the passenger experience at checkpoints. 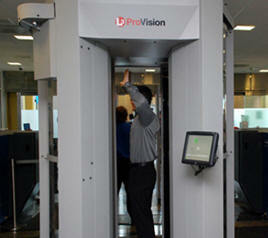 Transportation Security Administration (TSA) Administrator John S. Pistole announced that TSA will begin installing new software on TSA’s millimeter wave Advanced Imaging Technology (AIT) machines making upgrades designed to enhance privacy by eliminating passenger-specific images. This new software, also referred to as Automated Target Recognition (ATR), will auto-detect items that could pose a potential threat using a generic outline of a person for all passengers. In the coming months, TSA will install the software upgrade on all currently deployed millimeter wave imaging technology units at U.S. airports nationwide. By eliminating the image of an actual passenger and replacing it with a generic outline of a person, passengers are able to view the same outline that the TSA officer sees. Further, a separate TSA officer will no longer be required to view the image in a remotely located viewing room. In addition to further enhancing privacy protections, this new software will increase the efficiency of the screening process and expand the throughput capability of AIT. The new software automatically detects potential threats and indicates their location on a generic, computer-generated outline of a person that appears on a monitor attached to the AIT unit. As with the current version of AIT, if a potential threat is detected, the area will require additional screening. If no potential threats are detected, an “OK” appears on the monitor with no outline, and the passenger is cleared. TSA worked with the Department of Homeland Security’s (DHS) Science & Technology Directorate (S&T) and private industry to develop the new software. In February 2011, TSA successfully tested the new software at Hartsfield-Jackson Atlanta International, Las Vegas McCarran International and Ronald Reagan Washington National airports. The new software will be installed on all millimeter wave AIT units currently in airports, with plans to test similar software for backscatter units in the fall. AIT safely screens passengers without physical contact for both metallic and non-metallic threats, including weapons and explosives. Currently, there are nearly 500 imaging technology units at 78 airports nationwide, including millimeter wave and backscatter units, with additional units planned for deployment this year.